How to Test the Installation? and to compose previously existing software components (your own developments or from the component directory) to applications. Please note: The installation/update of the SmartMDSD Toolchain has been temporarily deactivated in December 2018, since we are changing the method of installation. You can use the script on this page to install a development environment. 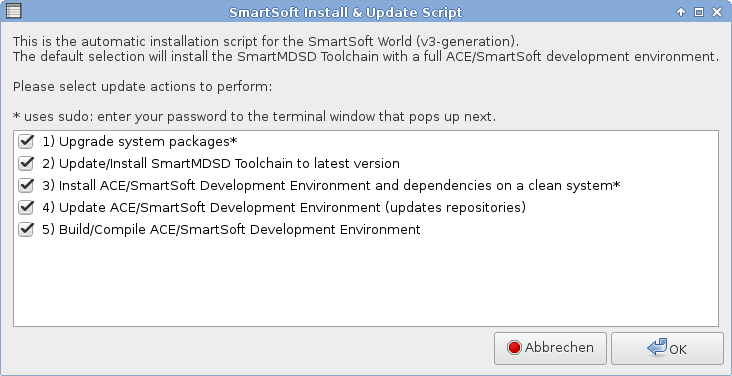 To install the toolchain, please refer to the manual installation instructions of the SmartMDSD Toolchain in the meantime. Architecture: x86(-64). ARM/RaspberryPi with experimental support. A menu with several options will appear (see screenshot). To install the full development environment, keep the default values. Once the installation finished, you will need to logout/restart to refresh the environment variables. See Tutorials to learn what to do next. 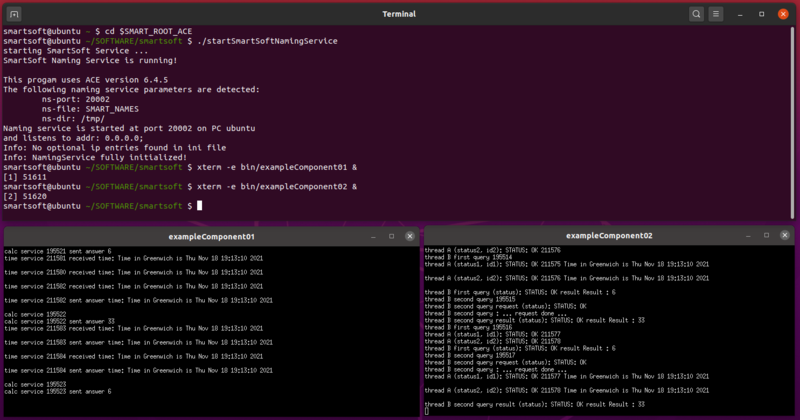 It will launch two example components exchanging data: you will see messages in both terminals (see figure below). Type CTRL+C to quit the components. In case you are an expert and need full flexibility: to install all tools and dependencies on your own, please refer to Downloads & Resources and the according documentation. Manual installation is not recommended.